BEIJING — Thousands of dead pigs, a number of them diseased, were found in Shanghai's major drinking water supply in the last two days, officials said. According to Xinmin newspaper, 2,813 pigs were fished out of the Huangpu River, which provides drinking water for Shanghai's 23 million people. When contacted for up-to-date information on the number of pigs retrieved from the river, officials referred NBC News to the local news report. Some of the pigs were infected with porcine circovirus (PCV) virus, according to an official statement by the Shanghai Agriculture Committee. The statement posted on China's Twitter-like social media service Weibo said that the disease would not infect humans. A water management officer said by telephone that results of hourly water tests were normal. "We are adding more chlorine as an action to protect water safety," said the official who would only identified herself as Zhu. 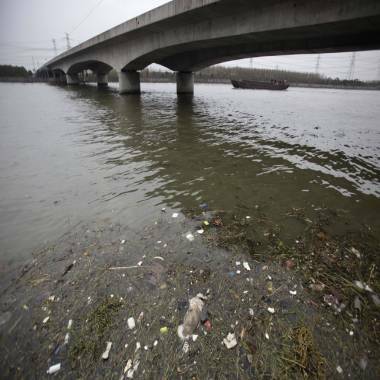 Water pollution, usually created by fertilizer run-off, chemical spills and untreated sewage, is a big problem in China. According to Reuters, the government will invest $850 billion over the next decade to improve the water supply system. People from the Songjiang area of Shanghai, where many of the pigs were found, said this was not the first time they had seen the carcasses floating in the river. A dead pig floats in a river on the outskirts of Shanghai on Monday. "Am I scared? I have been hearing this kind of news all the time, so I am immune," said Songjiang resident Ma Leiying, 42, who works as a clerk at a state-owned company. "I’m sure other cities have the same problems, but the difference is the incidents have not been reported yet." Some expressed outrage via Weibo. "Have we been drinking dead-pig-polluted water? We are already panicked by the polluted air now we have to worry about poisoned water too," one user wrote. Xinmin News, Shanghai’s most popular newspaper paper, reported that labels on some of the carcasses indicated that the animals had come from Zhejiang and Jiangshu provinces. According to Jiaxing Daily, many pigs have died in the area in recent months. In Zhulin village alone, there were 10,078 dead pigs in January, 8,325 in February, it reported. The newspaper added that the cause of death was down to the cramped conditions the animals were kept in. The Associated Press reported that the surge in the dumping of dead pigs came after a police campaign to curb the illegal trade in sick pig parts.